Q Project’s first outing on Hospital since the "Renaissance Man" LP from 2006, and these beats are in no way sub-prime. With rising prices and markets crashing Q project’s fiscal bail out comes as welcome relief at a time of intense junglist hardship. Credit Crunch hits harder on the dancefloor than an angry Northern Rock shareholder. Crashing oldskool amens and a tonking sub reminiscent of an era when the economy was more buoyant. Every bust is followed by a boom - and on the flip side comes "Just 3 Things" which shows a much more optimistic forecast for growth. With a simple melody and honest, innocent rhythm track it’s a back to basics sound which is sure to win over the hearts and minds of junglists worldwide. 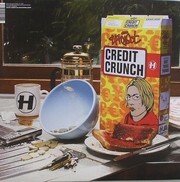 Featuring exclusive Credit Crunch cereal box artwork by Trickartt - this release will be highly collectable.